I NEED BOOK 13.But as for an actual review:Reading from Cricket's perspective was amazing and, at times, so sad. This series continues to blow me away with the relevance to kids, teens, and even adults' lives. Cricket informs us right off the bat that her parents can't stand her and that her mother left the family to go "pursue her dreams." So many people I know have dealt with similar issues, and it's sad and hard to see. Cricket is still dealing with this, even though she's never liked her mot I NEED BOOK 13.But as for an actual review:Reading from Cricket's perspective was amazing and, at times, so sad. This series continues to blow me away with the relevance to kids, teens, and even adults' lives. Cricket informs us right off the bat that her parents can't stand her and that her mother left the family to go "pursue her dreams." So many people I know have dealt with similar issues, and it's sad and hard to see. Cricket is still dealing with this, even though she's never liked her mother. Cricket's character grows and learns throughout the book, though her questions never cease.I enjoyed seeing her bubbly attitude and realistic look at life take the radicals aback in how she simply laid out what would happen if the LeafWings went straight into war and attacked the HiveWings and burned the hives. Death, and most of it innocent people.The first series arc started in the middle of a war with the Dragonets of Destiny dealing with the repercussions of a pointless war. This series is now taking the side of "what do you do after a genocide;" is it OK for retaliation or do things need to be left? What should be done. The characters, Cricket especially, struggle with these questions because wrongs have been done, yet another genocide is not the answer. Cricket starts to see her HiveWing world for the horrific slave-trade/indentured servant world that it is, at it's a culture shock for her to see how badly her world suffers from racism.All-in-all, I loved watching Cricket understand the repercussions of genocide and racism and watching her come to understand that the HiveWings are a racist society towards everyone else. I heard this on audio during my holidays in India and loved it. Excellent book. Highly recommended. The Hive Queen was released early at my local bookstore, so I've been able to read it a week in advance from the actual release date; this isn't a review based on speculation or my opinion of previous books, but on The Hive Queen and The Hive Queen alone. I'm going to start this off by saying: I didn't hate it. It was... tolerable. However, as the twelfth book in a series, you'd hope that it would be living up to its prequels, and it really isn't.The pacing is absolutely awful; the plot-changing The Hive Queen was released early at my local bookstore, so I've been able to read it a week in advance from the actual release date; this isn't a review based on speculation or my opinion of previous books, but on The Hive Queen and The Hive Queen alone. I'm going to start this off by saying: I didn't hate it. It was... tolerable. However, as the twelfth book in a series, you'd hope that it would be living up to its prequels, and it really isn't.The pacing is absolutely awful; the plot-changing event happens on literally two pages directly before the end of the book. It feels like the author felt that every page had to have something happening on it, and the result is a crammed, rushed mess where unimportant side characters are described for the same length of time as major revelations. 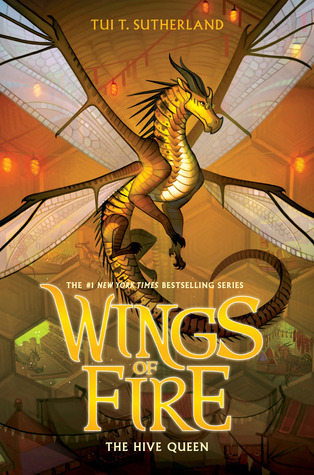 (view spoiler)['HiveWings and SilkWings are closely related and only split into two tribes a few generations ago', something that undermines the worldview of the main characters, is something that takes up about the same amount of page space as a single, two-scene side character being physically described. A lot of scenes, such as the meeting with the Chrysalis and Cricket vandalizing the statues, are completely unnecessary and could be skipped completely without leaving anything out of the story - which is a shame, because currently, skipping the same amount of words somewhere else could end up with you missing, for example, the fact that a revolution has started. (hide spoiler)]On top of the pacing and plot point saturation issues, there is also a major issue, in my opinion, with how interactions between the SilkWings and the HiveWings are described. (view spoiler)[Most of this book takes place while Cricket, Sundew, Blue, and Swordtail are in Jewel Hive, where they are disguised in order to keep from being identified by the Queen. In order to be hidden, Cricket dresses herself up as a rich HiveWing - Sundew, a LeafWing, along with Blue and Swordtail, who are both SilkWings and a race of dragons owned by the HiveWings as slaves, disguise themselves as her slaves. Despite the fact that they are disguised this way for most of the book, the protagonist Cricket only mentions how uncomfortable it makes her once; the rest of the plot ignores it completely. There is also a throwaway line at this point where it's mentioned that SilkWings slaves in this city are owned as decorations for rich HiveWings, and pose in windows as decoration; Swordtail responds to this with disgust, but Blue, who the narrative frames as the correct, non-violent view, suggests that some SilkWings may enjoy such a treatment... and then the issue is never brought up again. (hide spoiler)]The Pyrrhia characters who are featured in the book also feel shoehorned in. They only show up in the prologues and epilogues, and it feels more as though they're being used to make old fans interested in the new books instead of giving proper focus to new characters that will interest both old and new fans. Issues that are huge for the actual protagonists are easily handled by the preexisting characters who cameo ( (view spoiler)[Luna crosses the sea, nearly dying, but SeaWings can just swim there with no trouble at all; Moonwatcher, a NightWing, is idolized to a near-religious point by Luna, who grew up hearing about Clearsight, a NightWing from 2000 years in the past, who also became a religious figure in Pantala after flying across the sea. (hide spoiler)] )I want to enjoy and endorse this book, because I loved the series when it started out. But I really can't; not with the worrying way the author and narrative seem to view slavery and slaveowners as a plot device rather than a serious issue; not with how characters are flat and emotionless (unless they're the current protagonist, who is allowed to feel things); not with how the pacing is awful and rushed; not with how moments that should have emotional weight are skimmed over in a page or two and forgotten. I'd only recommend this book if you're invested in the series already and want to know where it could go next - if you're a new reader, I'd just stop at The Brightest Night. Dragon DramaWell, I didn’t expect some of those twists and turns! I really liked learning more about the dragons and thought it was interesting they have an innate sense of time versus time as humans understand it. Love little details like that! Anyhow, another good one that’s left off on an excellent cliffhanger - what’s next and which dragon will be the star? Sounds good!I have not started the book yet but I am excited to start it. I’ve been waiting forever for this book so it better be good. Wonderful as alwaysIt was wonderful as always. Read it all in one day (horray for sick days). Can not wait for the next one!! A work of artThis book is truly amazing and has satisfying details which make you love the book more! The ideas were brilliantly thought out and put on text very carefully.Highly recommend it.